Commissioners also are being asked to take action on a request for a license to sell beer and wine from an as-yet unbuilt convenience store on Macon Highway opposite the Athens Ridge student housing complex. Commissioners also will take action on their own request to rezone just less than two acres on the Oconee Connector and Daniells Bridge Road that currently is used for the Barber Creek Fire Station pursuant to relocating the fire station and are to discuss a contract with the state for a county-wide transportation study. The Board of Commissioners gave tentative approval at its meeting last week to the $1.9 million contract with Griffin Brothers Inc. of Maysville for the sewer line upgrade. Griffin was the low bidder among nine bidders for the project, which will replace an existing 6-inch pipe with 12-inch pipe and result in the decommissioning of the pump station on Daniells Bridge Road at Barber Creek. The pump station on Daniells Bridge Road at Barber Creek will remain in place in case of future need. The upgraded and existing line runs from the pump station on McNutt Creek across Parkway Boulevard from Kohl’s to behind the shopping center with Trader Joe’s, under SR Loop 10 and Daniells Bridge Road, and down Daniells Bridge Road and Government Station Road to the Lampkin Branch collector. The Lampkin Branch collector is on Lampkin Branch of Calls Creek, and the sewage flows from there via gravity to the Calls Creek wastewater treatment plant off Durhams Mill Way on the north side of Watkinville. The existing sewer line is on the west side of Daniells Bridge Road and Government Station Road, and the new line will be as well. Oconee County Utility Department Director Wayne Haynie told me last week he estimates that construction will start in late September or early October. The project will take about six months to complete, he said. 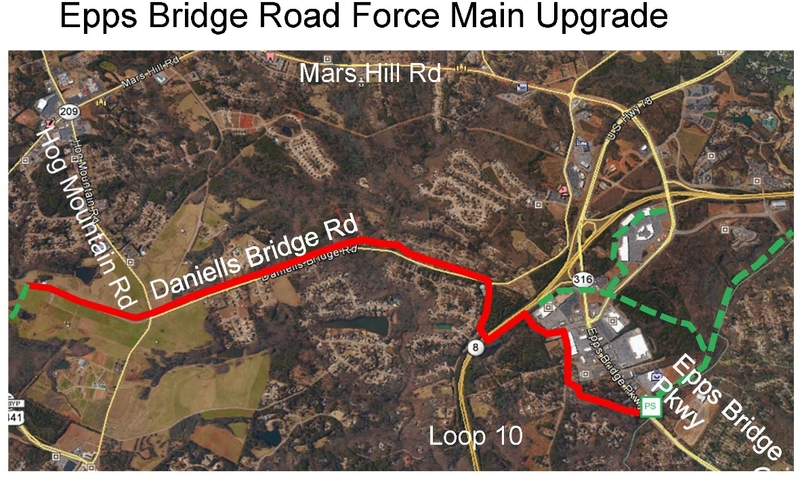 The contract documents require that traffic will continue to flow on Daniells Bridge Road at all times, Haynie said. 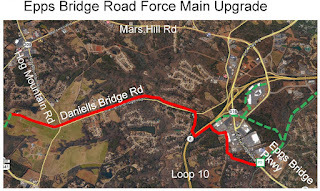 Traffic flow on Daniells Bridge Road has been heavier since construction began on Mars Hill Road, and that construction is scheduled to continue through the end of May of 2018. The award of the contract to Griffin Brothers is on the consent agenda, meaning it will not be discussed further unless a commissioner requests that it be opened up for discussion. 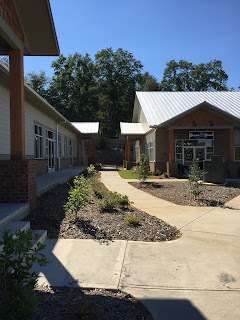 Carlos Miranda from Newberry, Fla., has applied for a license to sell package beer and wine from TreeHouse Market in Falls of Oconee, the retail complex under development on Macon Highway at McNutt Creek. According to the application, the convenience store will include a deli and sell snacks, drinks, ice cream, cigarettes and lotto tickets. The shopping center currently has a speciality food store, Olive Basket, a physical therapy facility, and a Board and Brush custom sign store. According to a billboard opposite the shopping center, it will include a Mama’s Boy restaurant in the future, though no building permit had been issued for the restaurant as of Friday of last week. The shopping center is easily accessible on foot to Athens Ridge, the student complex on the eastern side of Macon Highway. The Board of Commissioners is asking itself to rezone the land on the east side of the Oconee Connector and the north side of Daniells Bridge Road where Fire Station #8 currently is located. The 1.9 acres currently are zoned Office-Institutional-Professional. The county wants to change the zoning to Business. The county has not given any explanation for the rezone request or indicated where Fire Station #8 will be located in the future. The county planning staff produced a single page review of the request and did not provide its standard analysis of the impact of the rezone request or offer a recommendation. At the Board of Commissioners meeting last week Commission Chair John Daniell indicated that the county was about to enter into an agreement with the Georgia Department of Transportation for a county-wide transportation study. Emil Beshara also outlined the project at the Technical Coordinating Committee meeting of the Madison Athens Clarke County Regional Transportation Study last week. GDOT is entering into a $215,082 consultant contract with HNTB Corporation of Atlanta to provide a multi-modal transportation study for Oconee County, according to documents released by the county. HNTB will document and evaluate the exiting transportation system of the county and recommend needed improvements, those documents state. The cost to Oconee County will be $45,091. The video below is of the meeting of the Board of Commissioners on July 25. Utility Department Director Wayne Haynie gave a series of presentations to the Board on water and sewer projects in the county. Haynie’s comments on the sewer line upgrade begin at 23:28 in the video below. Daniell’s comments on the county-wide transportation study begin at 42:20 in the video. OCO: BOC 7 25 17 from Lee Becker on Vimeo. Lovely. That sharp turn on Macon Highway is treacherous. The college students pulling in & out of Athens Ridge have little regard for others. Now add beer & wine to the mix, with Athens Ridge college students crossing Macon Highway on foot. Thank you Melvin Davis.